The old adage is true: breakfast is the most important meal of the day. 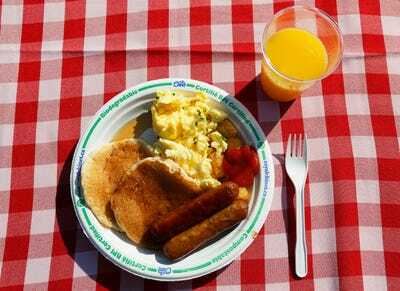 A new study published last week in the American Heart Association journal Circulation found that middle-aged men who skip breakfast are more likely to have a heart attack or die from heart disease. The news validates what scientists have long known: eating breakfast consistently pays off through nutritional and mental health benefits, both in children and adults. “Breakfast happens to be the easiest time to get in heart-healthy fibre from whole grain cereal and oats, which can help lower blood pressure and cholesterol,” says Lisa Mosokovitz, a registered dietitian and owner of Your New York Dietitians. A person who regularly skips breakfast is probably “eating too much of the wrong kind of things at night,” she notes. 1. Skipping breakfast makes you fat. Breakfast-skippers have a higher risk of obesity, according to a 2003 study published in the journal of Epidemiology. Eating more, small meals earlier in the day prevents people from overeating later in the day. It also suppresses concentrations of insulin, a hormone in our body that encourages fat cells to take up fatty acids and store them. 2. It makes you forgetful. A study of elementary school children, a small 2005 study published in the journal Psychology and behaviour [PDF], found that elementary school kids who ate a breakfast of oatmeal had better short-term memory than students who did not eat breakfast. 3. It increases your risk of type 2 diabetes. Women who regularly miss breakfast have a higher risk of type 2 diabetes versus women who eat breakfast every day, according to a six-year study that was published in August in the American Journal Of Clinical Nutrition. 4. It makes you mean. Breakfast foods contain vitamins, minerals, and other nutrients to jump-start your day. If you’re running on empty, it won’t be long before you begin feeling tired and cranky. A 1999 study published in the journal Psychology and behaviour showed that adults who kicked off the day with a solid breakfast had a “greater positive mood” than subjects who ate nothing.